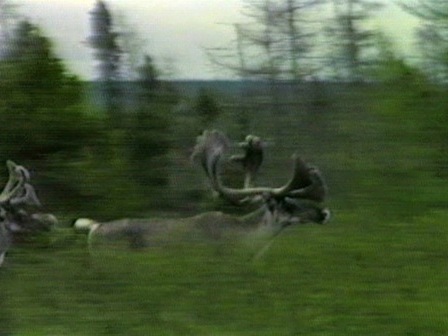 Innu have always shown the greatest respect for the caribou. From time immemorial, this boreal cervidae has provided the Innu with all they needed to survive in the bush: food, clothing, tools, materials and games. Hunters would say: "without caribou, there is no caribou." Thus, without caribou, there are no snowshoes for the hunter, who cannot get around in winter. Subsequently, he is exposed to famine and death. A group of hunters might possibly know where to find caribou, but find themselves unable to get to them without tools made from caribou. The association between the Innu and the caribou is so strong that the entire Innu society is modeled on it. Whether one is talking about the land, history, spirituality, material culture or even relations with other cultures, the connection with the caribou is never very far away. 7:19 min. - It is said that the caribou is an Innu animal. It’s true that Innu hunters are very familiar with it, down to its slightest habits. Every phase of a caribou’s life is given a specific name. Jean-Baptiste Bellefleur - When you see caribou from afar, you can tell which animals are in the herd, just by looking at the antlers. That's how we differentiate between animals and know which is their role in the group. When hunting, we look for "shituteu" (the strong one) by looking at the antlers. This is the lead caribou, the one I try to kill first. If I can kill him, the others will be surprised and freeze for an instant. The fawn is born in the spring, it's called "umuanish" (baby). It spends the summer with its mother, till it's weaned. In October, the fawn, male or female, becomes "atikuss" (little caribou) and remains so until the following autumn. At this point, the young doe is usually pregnant and is called "nushketikuss" (young female). After giving birth, her name changes again and she becomes "nushetik" (adult female). During the mating season, "nushketikuss" (young female) may remain with her mother during mating. At the beginning of the mating season, the young male atikuss (young male) does not yet have antlers and is pushed aside by "uishak" (chief of the harem). But during the summer, the young male's antlers grow and he keeps them all winter, becoming "aiapeshish" (adolescent male). He's taught to walk ahead and open up the path for the group. The following autumn, if he hasn't lost his antlers, he's called tshituteu (the strong one). He's now the one in front. He could lose an antler and still remain tshituteu (the strong one). In any case, he loses his antlers over the winter. He then becomes "upinau" (he who follows the others). Once he reaches the age of 3 or 4, as long as his antlers keep coming back, the young male can take his turn at being uishak (chief of the harem). He gathers all the females around him and pushes away the young aiapeshish (adolescent male). But they still try to take a few females away from him. After mating season, uishak (chief of the harem) retires to become "minaushneu" (hairy-legged caribou). He seems very tired. You can see him dragging his hoofs, sitting down, having difficulty following the others. And when the snow comes, he loses his antlers and becomes upinau (he who follows the others).